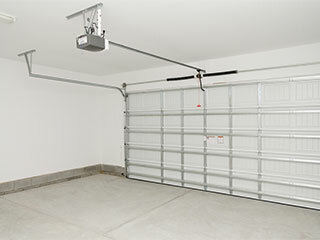 Along with the springs, the opener is among the most important parts of every garage door system. Without it, you will have to manually lift and close your door each time you use it. Every opener unit is comprised out of a motor and a rail with a trolley, as well as an arm which is attached to the door itself. Once plugged into your electric outlet, the opener will make your system's operation automatic, which will save you a lot of time and effort. Most models typically come with a pair of remote controls for the sake of convenience, and two safety sensors whose main purpose is to prevent accidents. You can rely on us at Garage Door Repair Salt Lake City to fix any opener related problem. If you notice an issue, such as a strange noise, low opening speed or hanging drive chain, you simply need to let us know. You can use our emergency service in addition to scheduling a regular appointment. We run a full system inspection of the unit when we arrive, in order to correctly identify the cause of the issue and to find the most effective solution for it. Our technicians are extremely experienced and dexterous. They always arrive fully prepared to implement any solution on the spot. Whether you have a Genie opener with a failed circuit board or a Marantec unit with a damaged gear, we can restore it to an optimal condition in no time. We always have spare parts of the highest quality at hand. We do a lot more than repair malfunctioning units. Our technicians are experts in replacement as well. We can easily switch out your worn-out model for a new and improved one. You can count on us to not only install it flawlessly but to help you find the best one for your particular needs as well, taking full consideration of the horsepower output and noise level that you both prefer and require. Once our installation is complete, we'll adjust the force and travel limits of your system to make sure it doesn't hang slightly open or slam into the floor when it operates. For any opener related problem you may have, call our professional team at Garage Door Repair Salt Lake City. We're your one-stop shop for solutions and/or improvements of every type.